If your company is in the business of shipping merchandise, you’re probably familiar with using bulk containers and the high costs associated with purchasing them. Buying new bulk containers can be very expensive, and unfortunately is not a viable option for all companies. A great alternative to buying new is to buy used bulk containers. There are many companies that now provide this as an option, and many benefits to buying used the next time you need containers. Whether your company uses metal storage containers, bulk containers or industrial bins, purchasing these bins upfront and reusing them is much more cost-effective than using cardboard boxes that can only be used once. You can save even further by buying these bins used. There are many companies that will allow you to buy these used bins in bulk. Buying in bulk is one of the best ways to further bring your costs. Not all local storage centers will allow you to buy used containers in bulk; however there are many online websites that provide this service. You can find several of these operations by doing a quick search online. These companies have a large selection of used bins available for purchase, and you can do all of your shopping from the convenience of home or at your office. By online shopping you’ll also have the opportunity to do a bit of comparison-shopping to ensure you get the best price available for your bulk containers. In addition to saving money, another great benefit to buying used instead of new is that is cuts down on unnecessary waste and is much better for the environment. Think of all the metal, plastic and cardboard you will be keeping out of landfills by buying used shipping containers that can be reused for many years to come. You can help even further by selling your shipping containers that you no longer use, rather than throwing them out. Selling your shipping containers is another excellent way to recoup your costs. Shipping containers are built to last for many years. Normal every day wear and tear will not affect the usability of a shipping container. They will perform well for a long time to come, which is why it’s such a great idea to buy and sell your used shipping containers instead of discarding them. In particular, plastic containers are excellent for buying and selling used, as they are easy to maintain. They can very quickly be cleaned and are cost-effective to transport, as they are one of the lightest options available. If you are interested in buying used bulk containers, you can find several reputable companies by looking online. Companies like Container Exchanger make it quick and simple. The listings on their website include all fees up front. They have eliminated the “middle-man” to make the purchasing process even easier. They will arrange to ship your products to you through a simplified order delivery process. Their stock includes used bulk containers, storage bins, plastic pallets, wire baskets and much more. This entry was posted in Bulk Containers on April 25, 2014 by madden_david. What Can Metal Containers Be Used For? For companies seeking a lightweight and durable shipping solution, look no further than used metal containers. Metal containers are incredibly popular in the shipping industry because they protect materials in a wide range of temperatures and climates. Additionally, metal containers are also useful for storage purposes. The following article discusses the various types of metal containers used in shipping and storage. Metal storage bins are constructed with metal frames and solid steel walls. Because of their durability, these metal containers are used to transport a variety of industrial products, consumer goods, and construction materials. 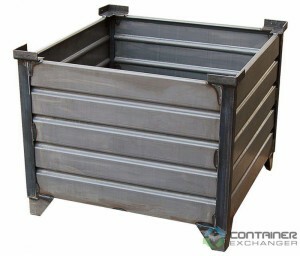 Because metal storage bins are generally smaller in size, they can be used for transcontinental shipping purposes. Metal containers are an excellent option for business owners who have a shortage of storage space in their warehouses or other storage facilities. Metal baskets and storage bins offer unparalleled protection for the products inside thanks to the strong, durable and rigid walls. Plus, they allow products to be stacked vertically, maximizing floor space. Not only does this help save money, but products can be organized and inventoried, saving time and money when it comes time to ship products to customers. Metal baskets and storage bins are weather resistant, meaning that they can withstand large temperature fluctuations without fear of failure and damage to products. This is especially important when shipping products overseas. Container Exchanger works with many businesses across the world to facility the sale or purchase of used metal containers. This helps companies in several ways. One, companies looking to sell used metal containers can discover a new revenue stream that can help boost their bottom lines. Secondly, companies looking to purchase metal containers can do so at a greatly reduced price, helping the company save money. This entry was posted in Bulk Containers, Metal Bins, Wire Baskets on April 17, 2014 by madden_david. Individuals looking for bulk bags needn’t look beyond basic designs, and those looking for used brands should look at a used “Super Sack” brand for sale. Bulk bags are also known as super large sacks, jumbo bags and big bags, and they’re considered flexible intermediate bulk containers. The “Super Sack” brand contains qualities of each, and it’s made from a collection of durable woven plastic capable of withstanding long periods. Each bag is heavy, and each bag is strong and comes with a set of lift straps contained upon each bag’s top. The straps enable movement and handling when moving, and each bag may be lifted with a standard-sized forklift. Many “Super Sack” bulk bags utilize a spout to empty contents. The spout removes vacuum-like effects, and it makes cutting unnecessary. Customers receiving a “Super Sack” bulk bag, they can expect an easily-accessible bag conveying its exact needs. Each bag may be quickly emptied when desired, and many bags may be used for processing equipment. Many individuals will utilize the “Super Sack” bulk bag for storing, shipping and dispensing products, and the brand provides enough versatility to deliver quality usage repeatedly. Many styles and types of bulk bags are available, including spout top bags, food-grade bulk sacks, spout bottom bags, flow-through sacks, super large sacks, Hazmat bulk bags, U.N bulk sacks. Many options deliver different spout configurations, lifting strap configurations and carrying capacities, and many may be purchased as new or used products. Selecting the correct “Super Sack” bulk bag helps individuals save money, and each selection is ideal for those looking for jumbo and bulk bags while adhering to company budgets. This entry was posted in Bulk Bags - FIBC, Bulk Containers on April 16, 2014 by madden_david. Wire Baskets are sturdy storage containers that are constructed out of heavy duty wire mesh. These containers have rigid, but open sides that offer a great deal of product protection with high visibility. They are often used by businesses as storage containers for fragile goods and work in progress while others use them as protective shipping containers for heavier products that have a long distance to travel. Wire baskets come in a wide variety of shapes and sizes and offer either rigid sides or collapsible. Collapsible wire baskets offer very flexible in terms of the situations they can be used in. Some businesses even add casters to the bottoms of the baskets in order to allow for greater ease in the movement of products from one area of the warehouse to another. Wire baskets offer flexibility in terms of customization more than other forms of storage containers in that they offer businesses a number of options including: collapsible, drop doors, stackable, mesh walls, the gauge of steel used, the load capacity, and the size of the container. Many businesses seek the versatility and protection that wire baskets offer however, they can be cost prohibitive to purchase new. 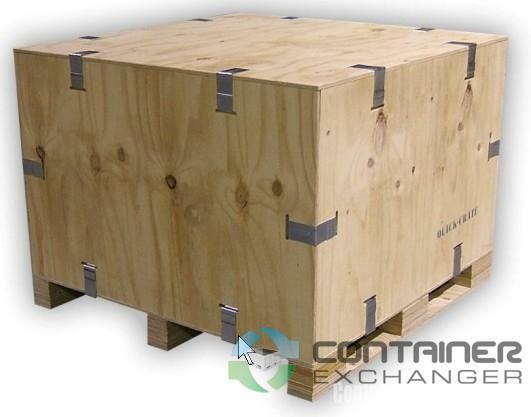 At Container Exchanger, these highly sought after storage containers are priced less. They can do this because they offer businesses the ability to purchase these containers used, saving them a ton of money over buying new. Businesses looking to purchase used wire baskets can peruse the site regularly in order to locate the wire basket that fits their needs. 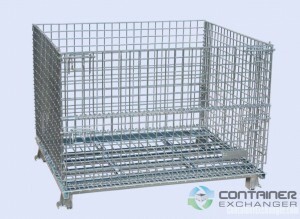 Companies with wire baskets to sell can contact Container Exchanger and list an as or receive a list of companies looking for the particular wire baskets they are trying to sell. 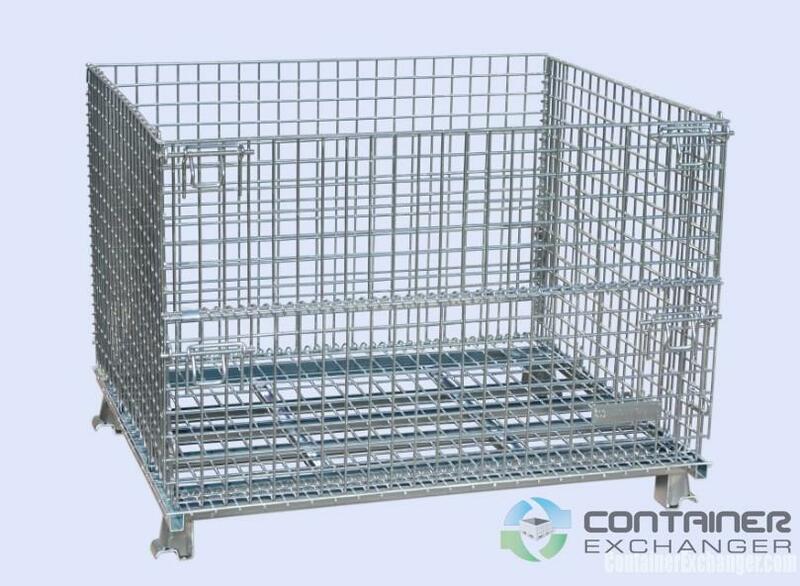 Container Exchanger has a network of businesses that buy and sell used wire baskets all over the country, so they can locate a buyer or seller for the wire baskets you have or need. This entry was posted in Bulk Containers, Wire Baskets on April 15, 2014 by madden_david. A stack rack is a storage container that features a pallet and four vertical side posts. These posts are positioned on the corners of the pallet. Stack racks, which are sometimes referred to as stackable containers, stackers, or stackable pallets, are made of plastic, wood, or metal. The rack’s pallet and posts are usually coated with a resilient powder-based paint that looks keeps its luster over the course of many years. Stack racks are unique because the sides of each rack can be completely removed, collapsed, or folded. 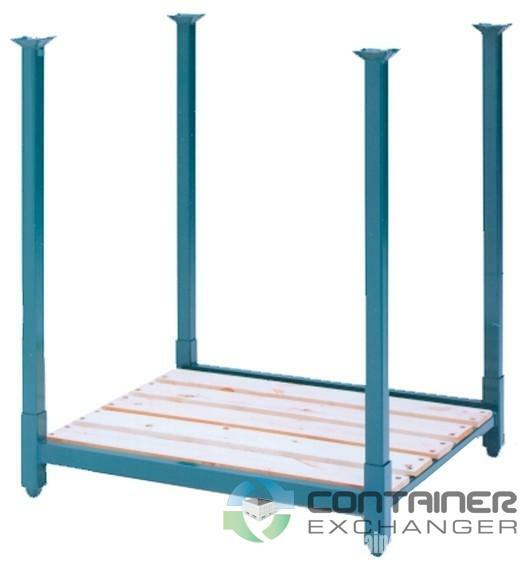 Depending on your needs, the ability to remove a stack rack’s upright posts can be useful if you are transporting the containers to different areas of your factory. If you are unable to find stack racks that meet your needs, these storage containers are also available in custom sizes. Stack racks can also be designed to have either rigid or collapsible posts. Collapsible posts are important if you plan on stacking the pallets on top of each other. One of the biggest benefits of stack racks is that these containers are extremely lightweight and portable. For this reason, stack racks are often pushed together so that irregularly-shaped objects can be organized and displayed. For example, stack racks are commonly used in lumberyards, where long pieces of plywood are stored. Other items stacked on these high density racks include PVC tubing and plumbing pipes. Additionally, factory supervisors can stack these racks up to 10 units high, allowing them to maximize space in cramped storage areas. Stackable racks are designed to utilize vertical air space instead of horizontal floor space. Most importantly, though, stack racks help streamline the manufacturing process. The containers are also an effective way to ship products and materials to customers. This entry was posted in Stack Racks on April 14, 2014 by madden_david. Depending on the manufacturer, plastic pallets are either constructed of recycled plastic or virgin plastic. Besides the differences in materials, plastic pallets can be used for a wide variety of purposes, too. For example, plastic-based pallets are popular among exporters and manufacturers because they do not need to be heat treated before transport like wood pallets do. From a cost perspective, plastic pallets are much less expensive than metal pallets, which are generally very expensive. 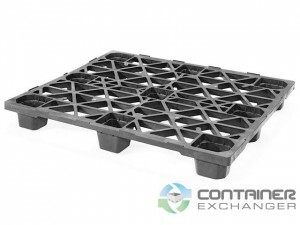 Additionally, plastic pallets are much lighter than their metal-based counterparts, without sacrificing any of the durability, weigh-bearing capabilities, or impact protection. Plastic pallets also possess shorter lips than metal pallets, making them easier to maneuver in tight spaces. Other types of plastic pallets include: rackable, stackable, nestable, export pallets, drum pallets, and solid deck pallets. Rackable pallets are among the strongest plastic pallets currently available on the market. These pallets do not have any decking, just a front and a back beam. This sparse design allows rackable pallets to hold a significant amount of weight without buckling. Stackable pallets, on the other hand, are designed to let an individual stack the pallets on top of each other without damaging the load. Like nestable plastic boxes, nestable plastic pallets are distinguished by raised sidewalls. The reason nestable pallets are popular amongst shippers is that the nested design allows shippers to stack the pallets on top of each other, saving 50% of the space used by conventional pallets. There are even specially designed plastic pallets that are made for transporting oil drums or drums of liquid. These unique pallets are called drum pallets, and have design features that help contain spillage. If you plan to use plastic pallets for moving or transporting materials, ensure that the pallet you are using has the structure needed to properly support the weight of your shipment. This entry was posted in Pallets, Plastic Pallets on April 10, 2014 by madden_david. Professional business executives are always seeking ways to save on storage and distribution expenses to remain competitive. The idea of recycling IBC totes has come of age as business managers embrace this proven way of managing costs associated with the storage and transport of products. IBC totes and tanks are containers designed for the purpose of storing and transporting liquids and fluids safely and in compliance with established regulatory guidelines. Used IBC totes can be purchased to transport and store volatile and fragile products. Food, flammables, drugs and corrosives require special attention for storing and shipping. A wide range of IBC tote choices are available, including food grade containers designed to meet strict guidelines for food transport, reconditioned totes and new totes. Used IBC totes offer an excellent way to save money since they can be bought and sold as needed through companies like Container Exchanger. Prudent business managers seeking ways to lower costs embrace Container Exchanger as a valuable resource where they can buy and sell used IBC totes. This type of partnership allows managers to enjoy the benefits of recycling without having to spend a lot of time trying to locate the totes they need. The reasonable prices and convenience offered encourages a growing number of business managers to get involved with recycling. Partnering with a company like Container Exchanger is an excellent way to cut distribution costs and also take a step to participate in recycling efforts. Business managers can support the “green movement” by buying reconditioned totes instead of always purchasing new ones. As is the case with all recycling, the end result is a positive one for both the environment and consumer. Reducing landfill waste and controlling distribution costs are two objectives satisfied by reusing IBC totes. This entry was posted in Bulk Containers, IBC Totes on April 9, 2014 by madden_david. A crate is a type of shipping container that is used to carry large and uneven shaped items from one location to another. It can also be used to transfer delicate merchandise depending on the sturdiness of the crate itself. Companies that frequently ship goods over long distances are well aware of the fact that wooden crates are built to be very long lasting and can be reused. Thus, if you need to buy one for your shipment, choose a used wood crate for your products. Wood crates are usually built with a fixed and strong framework and may be covered with a sheath or coating. As long as the wood used in the crate is free from rot or bug infestations; new and used wood crates can function alike, allowing you to pack your belongings in them for a safer shipment. These wooden crates can be manufactured using different types of wood; including lumber or timber wood, plywood, etc. Although your cargo can safely be transferred from one point to another in a wood crate; wood is easily affected by weather changes. Thus, the quality of the used wood crate needs to be checked properly to ensure that your goods will not be damaged during the transportation and shipment. It is also important to note that if bad weather conditions prevail during the shipment process, the nails holding the crate together can rust or become loose, resulting in an unsecured wood crate. The performance of a wood crate greatly depends on the quality of the wood along with its design, and firm built; so choose your shipping container with care. Whether you are buying a new or a used wood crate; buy the best quality available so that your merchandise and belongings can travel through the shipment process without getting spoiled. This entry was posted in Bulk Containers, Wood Crates on April 8, 2014 by madden_david. When companies make a bulk shipment of goods, they must find a convenient and affordable way to ship those items from one location to another. While the actual methods used will vary based on the shipment method and what items need to be shipped, one of the most common options available involves the use of wood pallets. Typically, packages of boxes, sacks of merchandise and more will be placed on wood pallets, and the merchandise may include everything from boxes of canned goods to dog food, potting soil and more. The merchandise may be wrapped in durable plastic wrapping after it has been placed on the pallets for easier transport from one location to another. While this is a common method used, it is not always economical or environmentally friendly. Often, these pallets are destroyed after one use, and this results in ecological and financial waste. Companies that are looking for a better way to ship their goods may consider the benefits associated with using used wood pallets. 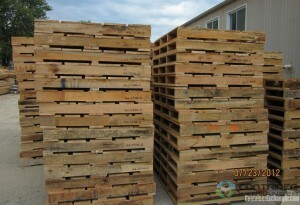 These may be used pallets that other companies are no longer using, and they may be in very good condition. They may also be refurbished pallets that have been restored to like-new condition. There are many benefits associated with the use of used wood pallets for your company’s shipping needs. 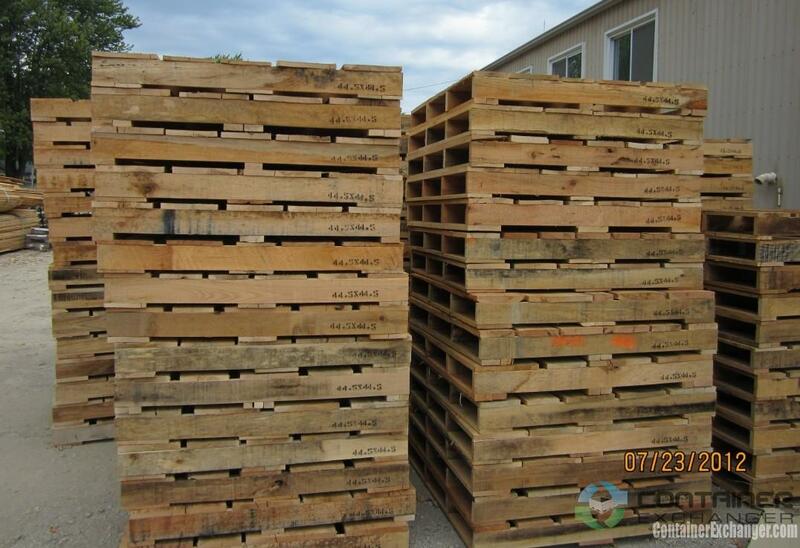 You can request a quote for these used pallets based on your specific needs for the size and number of pallets. By requesting a quote for these pallets, you will be able to learn for yourself how cost effective they are as a shipping solution. Furthermore, because these pallets are made out of wood, using refurbished or used pallets is a more environmentally friendly option to consider. Many companies today are looking for an easy way to transition to more ecologically friendly processes, and using used wood pallets for shipping is both simple and economical. This entry was posted in Pallets, Wood Pallets on April 7, 2014 by madden_david. Wire baskets can be used as storage containers for manufactured goods, or they can be used as small metal shipping containers to ship heavy product over long distances. 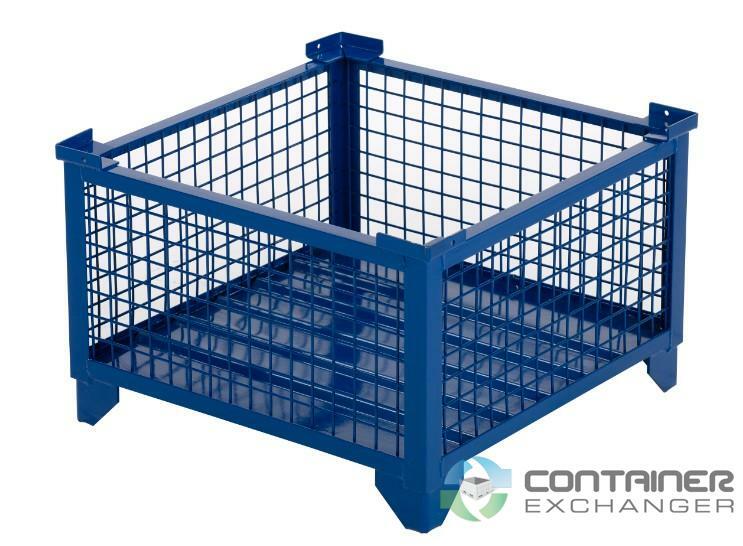 Mesh sided baskets are truly flexible in their application, whether you’re shipping brand new castings or collect scrap materials, a wire basket is a great heavy-duty storage option. Some of the options for these containers are: collapsible or rigid, drop doors, stackable, heavy-duty load capacity, and the size of the container. Certain sized wire baskets are also referred to as metal bulk containers, expanded metal containers and automotive baskets. Collapsible wire baskets tend to be lighter duty than the rigid wire baskets. Collapsible bins tend to be weight rated between 1,500 and 4,000 lbs. The collapsible metal bins are a nice option for a small metal shipping bin. They work well in this situation, because the sides of the container can be collapsed, thereby reducing the size of an empty container. The collapsed storage bin can be stacked in a corner of the warehouse, or they can be loaded onto a trailer for return shipment to your plant. The wire mesh version of the bulk container can be collapsible, but quite often, they are rigid. These wire mesh baskets are used extensively in industrial applications and they can stand up to quite a bit of abuse. You will find the rigid wire baskets are more durable (and more expensive) than collapsible wire mesh baskets. Due to the square tube steel construction for the corner posts, they can handle more weight and they are generally easier to stack. By comparison, the collapsible wire baskets can be quite strong, but they are slightly easier to damage, and they are not as sturdy when stacked. Wire baskets are a nice way to handle parts within a manufacturing environment. This entry was posted in Bulk Containers, Metal Bins, Wire Baskets on April 3, 2014 by madden_david.